Kaipoche! Residency has ended on the 22nd of January. Caroline Mackenzie, Jackie Berridge and Daksha Patel have shared their time, space and practices with other 8 indian based artists for the whole residency period. 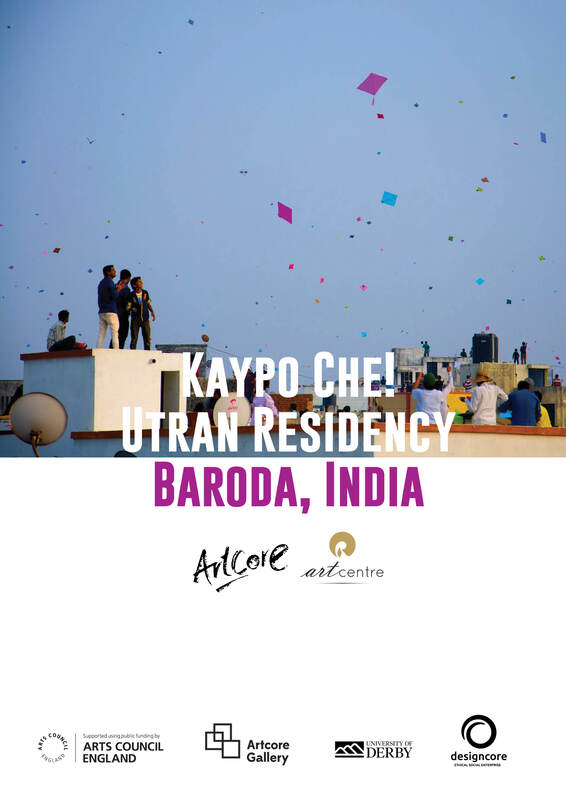 The programme was looking at creating a critical dialogue with the artists in residence and enable them to develop a specific project to respond to the worldwide famous Uttrayan Kite Festival in Baroda. 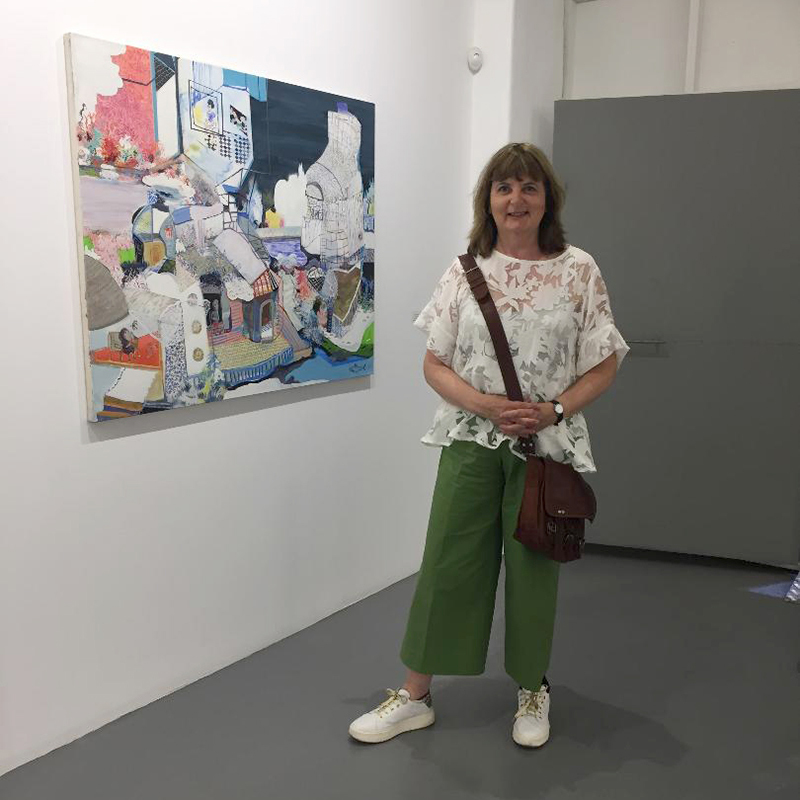 Open studios, sharing events and studio visits with international curators have been one of the most exciting part of the programme which culminated into an artist talk at the M.S. University of Baroda on the 9th January and a final exhibition of artworks created during the residency and the artist camp at the Reliance Art Centre in Baroda. During the artist talk at the M.S . University of Baroda Jackie Berridge, has explained her journey in the arts. 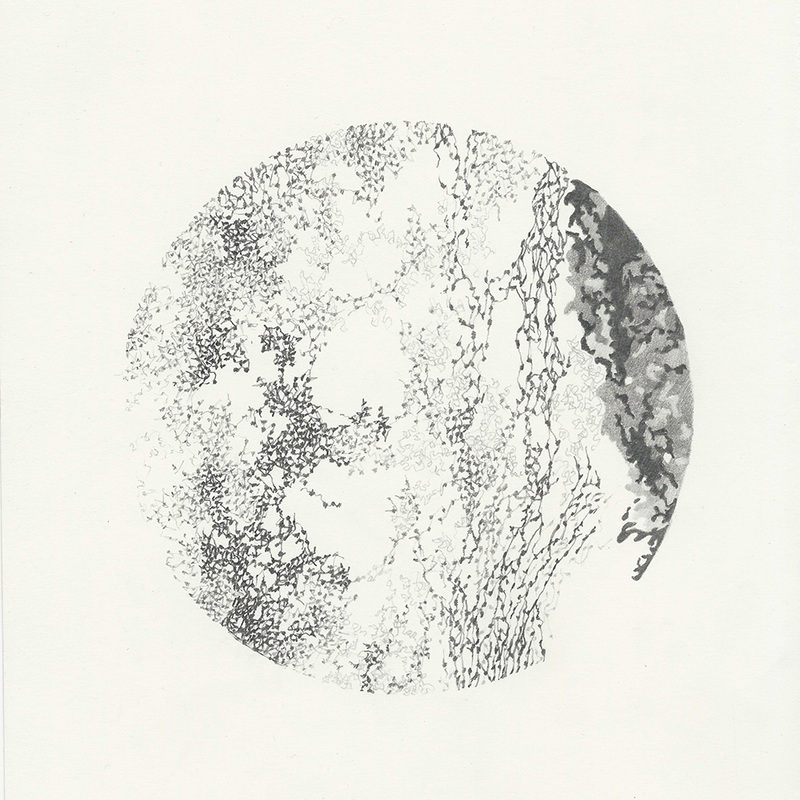 Nottingham based artist, her practice is informed by drawings and observational sketchbooks. Her visual reference is a mix of collection of memories and all senses experience. Daksha Patel started her presentation talking about Kaipoche residency! And how fantastic has been so far, creating and sharing her work with Indian artists. She works with mapping technologies to visualize data. To do this she uses different methods that include drawing as a way to formalize it. Images of brains and neurons has expired her works so far as well as technologies that captured data form the body in different way. Caroline Mackenzie has presented her work, developed over the last 10 year. Starting from a sculptural point it moved on a more performative side. 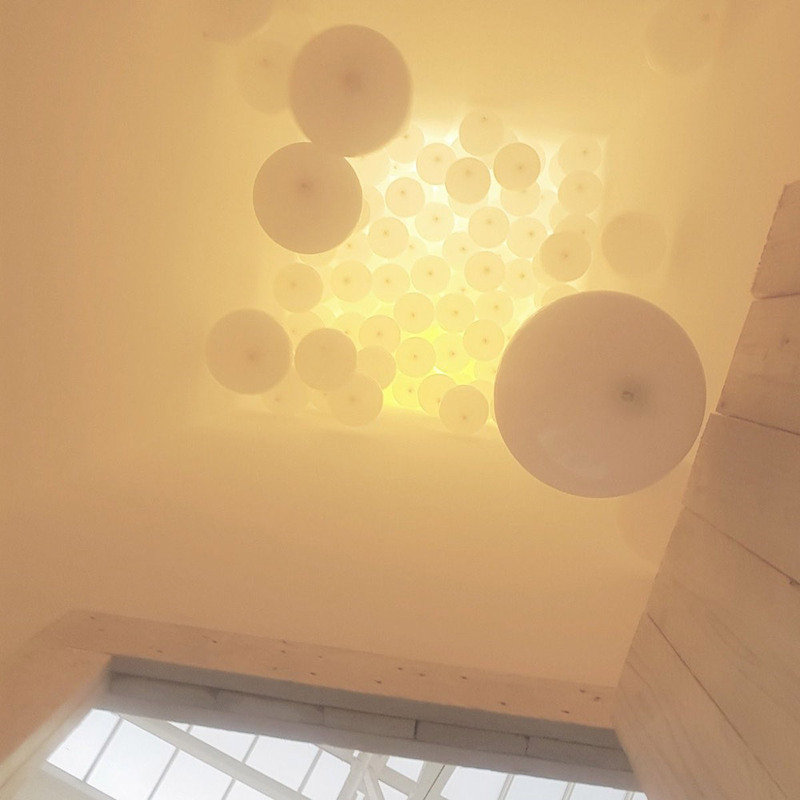 Recently she has focused her attention in the liminal space between reality and imagination: a space for suspension. She is developing a site specific project, based on an imaginative idea of suspension, for Kaipo Che! residency. Alongside the three uk based artists, Huw Davies and Phil Basi from The University of Derby have shared their practices and the film project they were developing for the Kite Festival. On the 13th January Reliance Art Centre, hosted a final exhibition of artworks by both artists in residence and artists from the Artist camp. The exhibition, called Kaipo Che! and curated by Sandya Gujjar featured works by: Jackie Berridge, Arunanshu Chowdhury, Abhishek Dodiya, Debasish Dutta, Ambika Indulkar, Sachin Karne, Bakulesh Joshi, Caroline Mackenzie, Rahul Mukherjee, Daksha Patel and Indrapramit Roy. The Kaipo Che! Residency was one of the best residencies I have been involved in. It surpassed expectations in many, many ways: in the level of interaction with India-based artists; the residency spaces and location; opportunities to experience the wider culture of Baroda and other nearby Indian towns/villages. Most importantly, there was an incredibly hospitable and welcoming atmosphere throughout, and it was a pleasure to spend time with everyone involved. Artcore is well organised and although events changed at short notice, the schedule seemed to run without drama and safely. Often we engaged in more activities than planned as we received more invitations for dinner and studio visits.This enriched our stay. Lastly, I believe Artcore is a very special organisation run by people who are passionate about what they do. I could see first hand the respect Zahir has with his peers in both India and the UK. His first hand knowledge of the city and his connections ensured we had a taste of the real India. Chiara is also a real asset, curating the show with the Indian/UK artists and ensuring the documentation of the Residency was recorded. Her support and conversations were invaluable. I cannot think of enough superlatives to describe my experience with Artcore. Thank you for your support, an amazing schedule and for your kindness! . The residency far exceeded all my expectations. The care and attention by both was outstanding. As an artist, this was a once in a life-time experience and one that has truly enriched my life, which in turn has a profound impact on my practice. The International Residency is open to two UK artists and it will be hosted at the Reliance India Ltd. township in Baroda city, in western India. There will be about 6-7 Indian artists joining in locally. The Residency and Artist Camp will be held in the beautiful, green surroundings of the Reliance township with a lot of peacocks and hornbills and other birds. January is also a very pleasant time to visit India when the weather is cool and temperate. The Utran(Uttarayan) or the Kite Festival is celebrated with great enthusiasm and vibrancy across the state of Gujarat (where Vadodara is situated) and the whole city is up on the terraces and roof tops flying colourful kites. It’s a wonderful time and as artists, you will not just have a great ‘visual’ time but can join in the kite-flying as well.